One of the warmest afternoons so far this spring is on the way. So too, is the next rainmaker. On Tuesday, the National Weather Service confirmed an EF-0 tornado touched down near Sorrento Sunday evening. The twister tracked north for 0.8 miles with a damage path 50 yards wide. Maximum winds of 90mph were strong enough to cause minor exterior building damage and uproot some trees. Today and Tonight: Surface high pressure in the Gulf will allow clear skies to persist Wednesday. Warm spring temperatures in the mid 80s are expected, though some spots could post a reading as high as 87 degrees. Overnight will stay mostly clear and light, south winds will stop low temperatures in the low 60s. 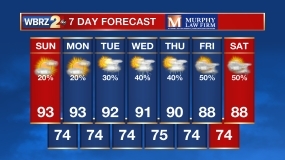 Up Next: Clouds will increase Thursday as a cold front approaches the area. Some showers may develop Thursday night with a few showers and thunderstorms around on Friday. The front will stall and linger on Saturday providing a lifting mechanism for scattered showers and thunderstorms to develop. A stronger upper level piece of energy and associated cold front will kick into the region Saturday night with another batch of rain and thunderstorms. Ingredients will be in place for severe weather, most likely along a squall line. Activity should wane on Sunday morning with temperatures going a few degrees below average on the other side of the front. The Mississippi River: At Baton Rouge, major flood stage continues with a level of 41.1’ as of Wednesday morning. Peaking at 44.1’ on March 19, the river set its 7th highest recorded crest at Baton Rouge. In addition, at 95 days this is now the 4th longest period above flood stage. River flooding and drainage north of the area will keep the river steady over the next several days. The high water is primarily an issue for river traffic and river islands, although some inundation will continue unprotected low-lying areas. At the current level, the grounds of the older part of Louisiana State University's campus are soggy. This includes the area around the Veterinary Medicine building, the Veterinary Medicine Annex, the stadium and ball fields. The city of Baton Rouge and the main LSU campus are protected by levees up to 47 feet. Some seepage may be noted due to the long duration of high water placing pressure on the levees. As some of the Mississippi River diverts into the Atchafalaya River, gauges at Krotz Springs and Morgan City will stay high as well. This creates backwater flooding in parts of Assumption Parish in areas such as Stephensville and around Lake Palourde. Like Big Muddy, this is expected to be a prolonged event but is not uncommon for the time of year. Read more HERE. An area of high pressure in the Gulf of Mexico will maintain clear skies and warm temperatures on Wednesday. This high will move east on Thursday with southerly surface winds allowing a bit of humidity to return. In the meantime, a cold front will approach from the west. The moisture return should be sufficient to allow clouds to increase Thursday, followed by some showers and thunderstorms into Friday. The front is expected to stall as the parent upper level trough lifts northeast from the local area. With the lingering boundary, scattered showers and thunderstorms may focus as daytime heating maximizes on Saturday. 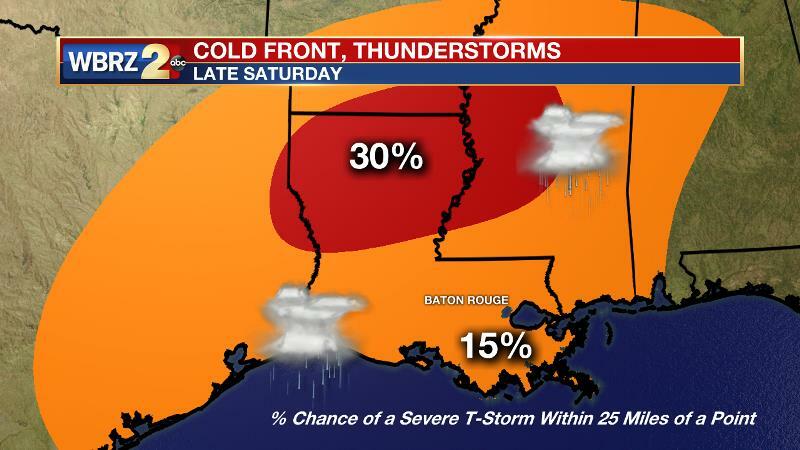 A strong upper level disturbance will move out of Texas into the Mid-Mississippi River Valley from Saturday to Sunday. At the surface a deepening surface low will move from Texas to Arkansas to Ohio will an associated cold front. Moisture pooling ahead of a stalled boundary across Louisiana and Mississippi will result in dew point temperatures near 70 degrees. The front is expected to provide uplift into an unstable air mass thus developing a complex of strong thunderstorms that will move across the local area during the Saturday evening timeframe. At this time, a squall line seems to be the most likely style these storms will take on but gusty winds and tornadoes will both be possibilities along this line. The front will move east Sunday as a longwave trough deepens in the Central U.S. Clear conditions and below average temperatures are anticipated for late Sunday through late Monday.